This is a pleasant, light and airy cottage reached by steps up to the barn converted in the 1970s and used happily by families and couples alike over the years. Entrance through the large kitchen, which is fully equipped and two steps take you up to the rest of the cottage. The large sitting room has views over the Bray Valley and the 3 bedrooms comprise, No. 1 double bed, and 2 single rooms and bathroom with bath/overhead shower, basin and W.C. Visitors staying here park their cars at the top of the drive. Brayford is a pleasant village, nestling in the valley, and there are lovely walks around the river and up to the Church. The pubs are 3 miles from here in all directions - all of which offer good food. 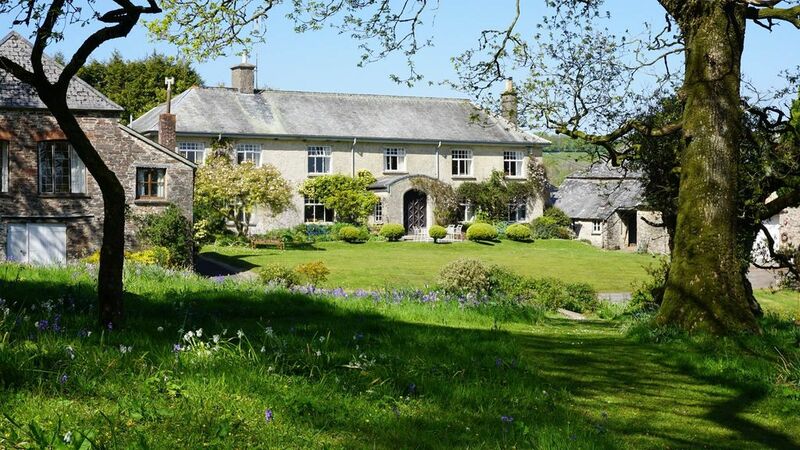 Interesting and traditional old country house set in unspoiled Devon countryside surrounded by sheep (and some horses). The cottages have been converted over the years from staff quarters and are simply and adequately furnished. They have oil central heating and electric fires. Both cottages have three bedrooms. The Barn Cottage faces south and has lovely views. The entrance is into the, fully-equipped, kitchen, then up 2 steps into the spacious sitting room, from which one reaches the 3 bedrooms. The double bedroom is spacious; and there are 2 single bedrooms plus bathroom with bath/overhead shower. SLEEPS 4. THE ORCHARD COTTAGE SLEEPS 5 in 3 bedrooms. This is on the east of the house and it has a kitchen and large sitting room; upstairs there are 3 bedrooms - one double, one twin and one single and a bathroom with large 1930's bath. The gardens are very spacious and shared by everyone. and lots of space for children to play outside: areas for football, cricket, bowls, croquet and always a cluster of hens, bantams and ducks to talk to and feed and tame sheep. Little Bray House was once part of the working farm. The farm belonged, until the 1920s, to the Acland Farmily from Killerton House and all the surrounding land likewise. Now we have 7 acres. A lovely place for children to play hide 'n' seek and have lots of "old fashioned" fun. The badminton court also has in it a ping-pong table. Brayford is on the edge of Exmoor and it has a small play area for children by the village hall, and also the river banks are great for picnics. Otters have been seen and kingfishers. Visitors love to spend days wandering over the moor, taking picnics to eat by the rivers or to amble into Dunster and then on to the Somerset coast and enjoy Minehead, Porlock and surroundings. Or to go directly to the large surfing beaches of Saunton Sands and Woolacombe. The small beaches are wonderful to clamber down. Combe Martin and Lynmouth are favourites with children and their fishing nets! Good pubs. Exmoor is well worth exploring - always quiet and beautiful with many excellent walks, deer spotting and Exmoor ponies can also be seen. Fun to explore on a bicycle too. Marvellous walks around Simonsbath and a coffee shop and pub in the village; also Exford, Dulveron, Withypool, Tarr Steps - all quiet and beautiful and fun for everyone. Riding schools in these places. LITTLE BRAY HOUSE IS IN A VERY BEAUTIFUL UNSPOILT PART OF NORTH DEVON. We have been living at and running Little Bray House holiday cottages since 1977. Wonderful environment here - fresh air, dark skies lit only by stars and the moon, spectacular fauna and flora. We wake up from April to September to see swallows shoot across the lawns. We love to share our unspoilt environment and OFFER DISCOUNT TO COUPLES OUT OF SEASON. PRICES ARE ALWAYS REASONABLE We have enjoyed living OFF THE BEATEN TRACK and have made garden furniture for many years. In addition to being creative in the management of our house and gardens. CHILDREN love the ENID BLYTON lifestyle. OLD CAR OWNERS WELCOME. ALSO CYCLISTS. ALSO WALKERS AND SURFERS! Our family enjoy all these bonuses and easy access to modern life, if required! Wi-fi. Most west-country children have been taken to Devon for a holiday at least once during their childhood and we are no exception. We remember the wonderful unspoilt beaches in North Devon very clearly and they are not hugely changed over the years. Exmoor is less well known and perhaps is even more of a pleasure to discover as it has history - with Neolithic sites on the Moor and of course well-known stories, like Lorna Doone, and the places mentioned in the book are well worth visiting. Adequate but please ask if there is anything not supplied that is needed. Golf courses are at Barnstaple (9 miles from us), Saunton Sands (16 miles) and Ilfracome (16 miles from us). Notes on accommodation: The accommodation is comfortable, cheerful and clean and each cottage has a television, cooker and microwave. We supply linen but not towels (unless for overseas visitors). Little Bray House was a working farm until the 1960s and has welcomed visitors for the last fifty years. Firstly as a guest house, then as self-contained flats and for the last 30 years as country cottages under the management of the present owners. The surrounding area is lovely to explore on foot. There are benches and tables on the lawns, and picnics are encouraged. The owners are around to answer questions and to advise on places to visit etc. While there are lots of tourist "attractions" all over Devon, walking and exploring costs nothing and can be done in most weathers! The cottages have details of places to visit in folders and lots of books to read, also jigsaw puzzles to tackle. Only 10 miles from the beach at Combe Martin, and 15 from Lynton and Lynmouth - a favourite destination. Outside: The house is set amongst lovely natural scenery, there are lawns to enjoy and walks all around. There are tables and benches available at all times and these can be taken to wherever one wants to sit - either with other guests or privately. There is a lot of space for everyone to enjoy and children to meet up and have lots of fun, playing football, cricket, croquet etc. If it is raining there is the indoor play area, i.e. badminton court, where soft ball games are played and ping-pong. This is an area of great natural beauty and bird-watchers are in their element. Also a delight for artists to sit and paint quietly. Exmoor is a "dark" area - i.e. the skies are still dark at night only lit up by stars and the moon. FLY FISHING, trout are usually quite small. LICENCE needed to fish and fishermen enjoy the peace and the possibility of seeing otters and other wildlife along the riverbanks. Brayford has a play area and "Millenium Garden" for picnics! Lovely Church and Chapel. Margaret and Christopher are very kind and helpful. The Barn cottage is not luxury but spacious, quiet and clean. The garden of the main house is very big, with lots of places to sit and enjoy the views. Exmoor is very nice for walking. Barnstaple is nearby and offers a lot of shops and restaurants. It is really important to us that our guests go home feeling refreshed. Also, it is a joy to share our peaceful corner of Devon with families who,love the countryside. Love this place - hope to visit again. The cottage was exceptionally clean, and we had a warm welcome from the owners. Each of the beds looked so cosy! I could have slept in any of them. The view from the main room is outstanding - I would have loved to have time to sit on the comfy sofa with a cuppa, a book and just enjoy the view! We appreciated being able to take our dog with us. The decor is great and simple enough for us not to be scared to use the place! Most people know South Devon beaches but NORTH DEVON is a hidden treasure. The coast is wilder and, although some beaches are popular with surfers, e.g. Saunton Sands, Woolacombe, Croyde Bay, they are a pleasure for everyone. Also, hidden beaches and coves can be found all along the coast, especially if one enjoys walking. EXMOOR is full of charm. Walking is great, also horse-riding and cycling. The little towns and villages on Exmoor are a delight, e.g. Dulverton, Exford, and walking at Simonsbath, Tarr Steps is a joy all year round. For gardeners the county is full of interest especially as the R.H.S. has its own garden near Torrington, ROSEMOOR. Also gardens near Barnstaple are Marwood Hill and National Trust, e.g. Arlington Court, Knightshayes and Killerton. There are garden festivals, e.g. one at Powderham Castle, near Exeter, 28-29 April. The Exeter Festival of Food and Drink is 29 April to 1st May. Exeter is an hour from us and the train journey from Barnstaple to Exeter is a pleasure. The Devon County Show i and is held 18 to 20 May and all ages enjoy this. Children always love the animals and tractors! Another beautiful North Devon village is Clovelly, a steep climb down to the sea through exquisite old cottages. Here there will be a Seaweed Festival on 4th June! At the bottom of the climb to the sea is a splendid pub. Booking Notes: ELECTRICITY IS BY THE METER - ACCOUNT TO BE SETTLED BY CASH OR CHEQUE UPON LEAVING. OIL FOR CENTRAL HEATING IS ALSO EXTRA - GUESTS pay FOR LITRES USED at cost price. Changeover Day: Saturday is our change-over day. We ask that guests leave before 10 a.m. and arrive after 3 p.m. Notes on prices: Please telephone to discuss prices. Out of the school holiday season we offer 20% discount to couples who wish to stay.